Noodler’s Ink is a low cost fountain pen ink that is 100% made in USA including the glass bottle and the cap. The philosophy of Noodlers is to create a quality product at a fair price. The design on the bottle depicts man's struggle with animal in the quest for fair play, thus the fair price of the Noodler's Ink. Noodlers offers a good quality ink that is affordable and comes in a wide selection of colors. To view the ink colors view the bottom left of the zoom image. Noodlers inks offer many great benefits such as forgery resistant, waterproof, or archival. To see the benefits and properties of each view the Noodlers Ink Properties. Note: Items designated by an asterisk are out of stock. 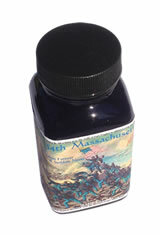 The Noodlers Bottled(3oz) Fountain Pen Ink usually ships within 1 business day unless otherwise specified. Each Noodlers Bottled(3oz) Fountain Pen Ink we sell is guaranteed to be genuine, authentic and will arrive brand new & unused! Noodler's has so many wonderful colors. This is fast becoming one of my top 5! Beautiful colour, Black Swan in Australian Roses. Using in my TA+d Silver/ bamboo fine nib. Right now I’m loving everything Noodler’s. I write and draw every day. These pens are the best pens next to dip pens. Every time I think that *this* will be the Noodler’s ink that doesn’t disappoint, I’m reminded of how awful these inks perform. Sure, they may have some with great shading or anti-fraud properties, but they can’t seem to make an ink (other than x-feather, which I haven’t tried) that doesn’t feather like crazy. I use Rhodia, Clairefontaine, and Tomoe River paper. It’s not the paper’s fault. After the last few Noodler’s I bought turned out to be some of the worst feathering inks I own, I’ve sworn off this brand. Noodler's makes a large variety great colors of ink. Noodler's 54th Massachusetts is a very aesthetically pleasing shade of blue and the ink has preformed superbly in every pen I have used it in. This is one of Noodler's "Bulletproof" inks and it is amazing how waterproof it is. This is one of my favorite inks, and just one of many great inks from Noodler's! I bought the Dragon’s Napalm after seeing examples of someone else using it. It’s not a color I’d consider but I do like it -kinda like a salmon or guava or papaya color. It does stain fountain pens. This is a large bottle. The color (House Divided) is a slightly reddish brown, a little less red and more brown than the sample seemed to show on the screen. Nevertheless, it is a color that will be noticed, and you certainly get a lot for your money. Noodler's ink is my favorite brand of ink. The bottles come filled to the very top, and the colors are great. All the different colors I am fully enjoying. Black Swan on the list is Australian Rose or English Rose? Is the Noodlers ink waterproof? If so which colors are waterproof? Can WE SEE COLOR OF INKS? We have a small swatch of the ink color on the zoom image for each Noodlers ink color. If you move your mouse over the image you will see it on the bottom left. The Noodlers Ink Habennero is a bright orange color.